paper bag & string: Cat Turns Human in the Movie "Miss Minoes"
Cat Turns Human in the Movie "Miss Minoes"
Miss Minoes, a former cat, in a tree. 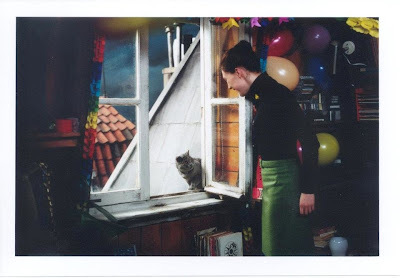 Miss Minoes looks like a movie for all cat lovers. It's on my list! A curious feline, Miss Minoes, is transformed into a young woman. She becomes friends with a shy cub reporter for the local newspaper. With help from her kitty pals she provides the reporter with a big scoop. The movie is a New York Times Critic Pick. You can read the Times review, here. that looks totally fun!! There are not many cat movies, I'll have to check this one out! Thanks for letting me know about it! Hoo Hoo Hoo ! I won't be around till next 3 weeks, But I would love to say...Merry Merry Christmas !! WE SHOULD GO SEE THIS!! It looks really interesting. Merry Christmas! That sure does look like a fun movie. We will put it on our list. Thanks for showing us the trailer and the pictures. We hope you have a super Merry Christmas. That looks like a really pawsome movie. Meowwy Chrissymouse, furriends! Oh the movie looks so much fun!! I gotta check it out! We wish you a very Merry Christmas! !